Chris Austin Hadfield, OOnt CD, (born August 29, 1959) is a Canadian retired astronaut. 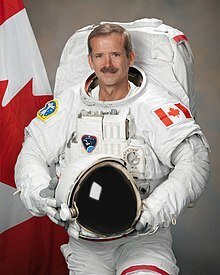 He was the first Canadian to walk in space. He has flown on two space shuttle missions and has also served as commander of the International Space Station which made him the first Canadian to serve as commander of the International Space Station when he lead Expedition 35 after launch on 19 December 2012. He was previously a Royal Canadian Air Force fighter pilot. Forbes described Hadfield as "perhaps the most social media savvy astronaut ever to leave Earth" with an audience all over the internet including over 1,000,000 Twitter followers, over 600,000 Facebook fans, one of the top Reddit AmA threads of all time and a popular Tumblr blog. Hadfield wrote a memoir title An Astronaut's Guide to Life on Earth and published it in 2013. The book became a New York Times bestseller and was the bestselling book in Canada on a Canadian subject. ↑ "Space: A (partly) Canadian frontier". Toronto Star. Retrieved 2014-04-21. ↑ "Biography of Chris Hadfield". Canadian Space Agency. Retrieved 2014-04-21. ↑ "Chris Hadfield on Twitter". Twitter. Retrieved 2014-04-21. ↑ "Col. Chris Hadfield on Facebook". Facebook. Retrieved 2014-04-21. ↑ "Five Highlights From Commander Chris Hadfield's Reddit AMA From Space". Forbes. Retrieved 2014-04-21. ↑ "Col. Chris Hadfield on Tumblr". Tumblr. Retrieved 2014-04-21. ↑ "Astronaut's worst fear: 'floating off into space'". New York Post. Retrieved 2014-04-21. ↑ "Best Sellers: Hardcover Nonfiction". The New York Times. Retrieved 2014-04-21. ↑ "Coast-to-Coast Bestsellers List" (PDF). MySTORE. Retrieved 2014-04-21. This page was last changed on 23 November 2018, at 00:49.